Behind Mr. Obama’s frustration: A striking divergence between the growing economy and the share of that growth going as income to the median American household. In the economic expansions of the 1980s and 1990s, roughly coinciding with the presidencies of Ronald Reagan and Bill Clinton, the amount of gross domestic product for each person in the economy, or GDP per capita (red in all the charts), was growing. And the median household income — the earnings of the middle household (blue in all the charts) — was also growing. Income inequality surely existed in the ’80s and ’90s, but the pie available was growing and Americans in the middle were getting a piece of it. 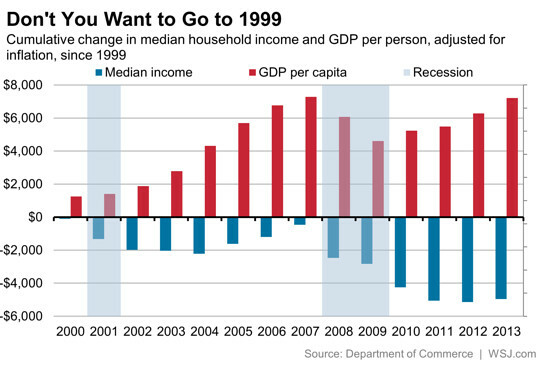 Then incomes slid during the 2001 recession at the beginning of George W. Bush‘s presidency and never quite recovered, even as GDP per capita continued to grow. The recession that began in December 2007 sent both measures falling. Since Mr. Obama took office, GDP per capita has reclaimed its lost ground. But these gains have not accrued to the median household. A look at the year over year change shows the breakdown. 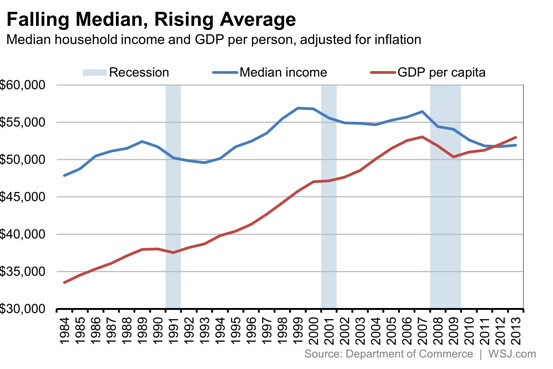 In the 1980s and 1990s, median incomes and GDP per capita both rose. But beginning around the year 2000, per capita GDP has posted a number of solid years, while median household income has had few years of positive growth. In 2013, median household income climbed for the first time since 2007, but by only a tiny bit — less than $200. Since 1999, this has opened a widening gyre between the two measures. 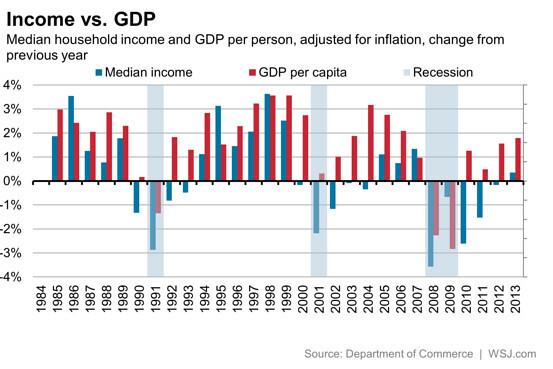 GDP per capita has risen, while median incomes have fallen. Mr. Obama would like credit for the recovery of the former. But it’s the stagnation of the latter that has left so many households dissatisfied. “ZURICH—Swiss voters overwhelmingly rejected an initiative that would have restricted executive salaries to 12 times that of the lowest-paid employee. “The youth wing of the Social Democratic Party of Switzerland, which organized the initiative, said the country had missed an opportunity to curb executive pay that it sees as spiraling out of control. Federal Taxes, 2010.” Here is some of what caught my eye. There are several main categories of federal taxes: individual income tax, the social insurance taxes that fund Social Security and Medicare, corporate income tax (which is ultimately paid by individuals), and excise taxes on gasoline, cigarettes and alcohol. This chart shows the average tax rates paid in each category, broken down by income group. 1) It’s important to remember that this is the average rate of tax expressed as a share of income. For example, those in the top 1% are almost surely paying the top marginal tax rate of about 40% on the top dollar earned. But when all the income taxed at a lower marginal rate is included, together with exemptions, deductions, and credits, this group pays an average of 20.1% of their income in individual income tax. 2) Average individual income taxes are negative for the bottom two quintiles. This arises because of “refundable” tax credits like the earned income tax credit and the child tax credit, which mean that many lower-income households not only owe zero in taxes, but receive an additional payment from the IRS. 3) In the calculations for effects of the corporation income tax, the underlying assumption is that high-income households end up paying much of the cost, because they are the ones who own most of the stock in these companies. In the calculations for excise taxes, the analysis is that low-income households pay a greater share of their income for these taxes, because they spend a greater share of their incomes on these products. The top quintile pays 92.9% of all income taxes and 68.8% of all federal taxes. The top 1% pays 39% of all income taxes and 24.2% of all federal taxes. 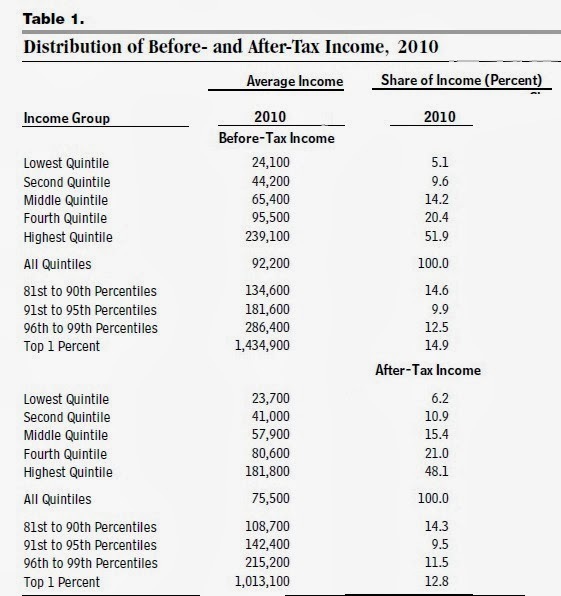 How have federal tax rates changed over time for various income groups? 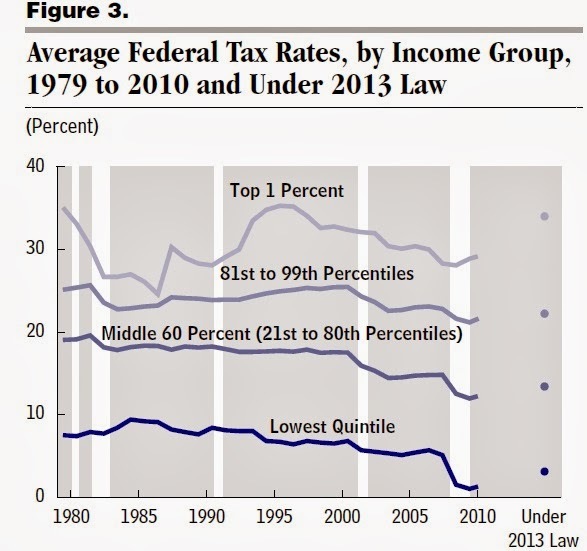 It’s true that average tax rates for the top 1% are down from the mid to late 1990s. It’s also true that tax rates for the rest of the income distribution are lower in 2010 than back in the 1990s. From 2008 through 2010, the federal tax rate as a share of income was at its lowest level during this time period. Of course, this is due in part to people having less income and finding themselves in lower tax brackets, and in part to various tax cuts aimed at stimulating the economy. Finally, how does the federal tax system alter the distribution of income in the United States? Here’s a table from the report that I edited to focus on the 2010 data. You can see that in terms of before tax income, the lowest quintile had 5.1% of income before taxes, and 6.2% of income after taxes; the highest quintile had 51.9% of income before taxes, and 48.1% of income after taxes; and the top 1% had 14.9% of income before taxes, and 12.8% of all income after taxes. Because these figures are based on income, they don’t take into account how spending programs that don’t provide income directly to people like Medicare, Medicaid, or food stamps affect consumption levels. I’ll close by saying that in my experience, presenting these kinds of statistics doesn’t really change anyone’s mind about whether the tax system is fair or unfair, or how the tax system should be altered. Back in 1938, Henry Simons of the University of Chicago wrote a book called Personal Income Taxation, in which he commented: “The case for drastic progression in taxation must be rested on the case against inequality — on the ethical or aesthetic judgement that the prevailing distribution of wealth and income reveals a degree (and/or kind) of inequality which is distinctly evil or unlovely.” Most people don’t alter their “ethical or aesthetic judgement” about what is “evil or unlovely” based on statistical charts. But I live in hope that the presentation of facts, like water against stone, can at least erode the sharper edges of some of our political disputes. But the question (for those of us who support capitalism but decry income inequality) is not whether there should be any inequality, but rather how much inequality we need to tolerate, and most especially whether a long-term trend toward growing inequality is good for the economy or the health of society. We can argue about how much inequality is necessary, but almost no one thinks that ever-growing income inequality is a social or economic good. So often now I hear discussion that assumes we can only choose on income equality to have zero inequality (as the old Soviet state aspired to) or basically ignore distributional issues. That is a false choice. Problem Productivity | Still Skeptical After All These Years. This is from the link in the previous post. You’ll note the hallowing out of the middle, even before the effects of taxes. 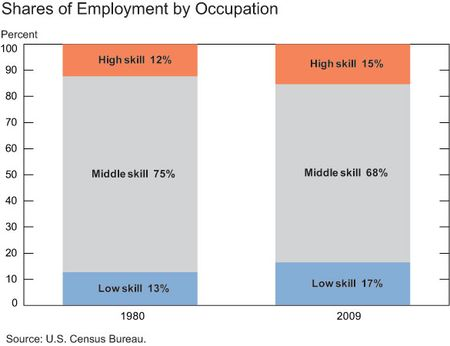 It seems we need a way to increase opportunities in the middle and prepare more people for high skill jobs at the top. More relevant education is the most obvious thing. Turning the Dialogue From Wealth to Values – NYTimes.com.